I have been on Ideal Protein since November 2012. I have tried to make it fun and exciting by trying a variety of Ideal Protein Foods and recipes. I will post my reviews of the different recipes that I have found, and the different foods that are available. Today was the day I was waiting for: received my order from Quest Nutrition. Sadly, I had already had my daily restricted product, so the Quest bars will have to wait until tomorrow. Luckily, I ordered the Protein Chips, which are unrestricted. I tried the BBQ flavour, since I love BBQ chips. I was not disappointed! This was a large bag, which was fantastic. 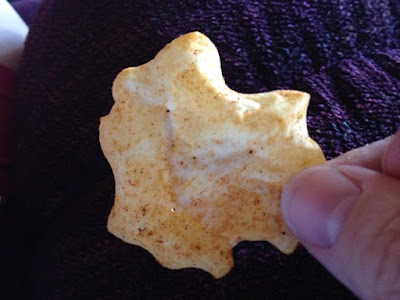 The chips were really crunchy and airy, and definitely satisfied the need for crunch. The BBQ flavour was light, but I wanted more of the flavour. The chips were salty, which was good. The part that I loved was that there was no protein aftertaste, and the chips didn't get mushy when I started chewing, the crunch remained. Again, just wished the BBQ flavour was stronger. However, I can't wait to try the other flavours.